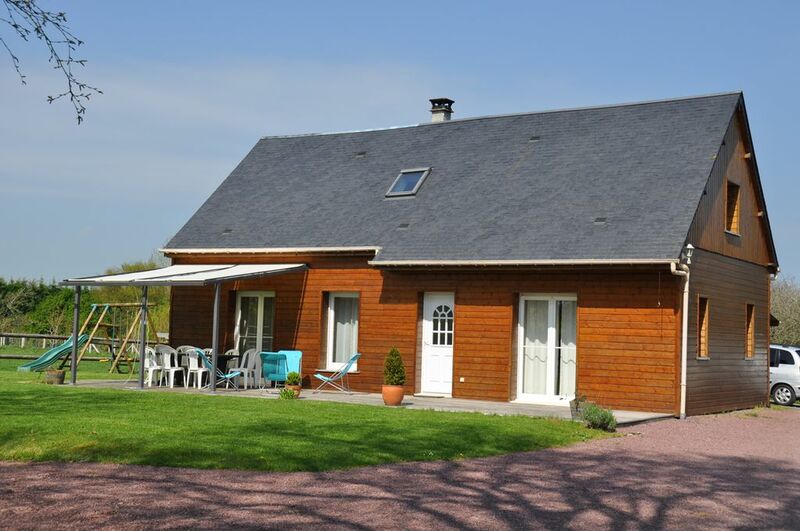 Beautiful wooden house of great comfort with a terrace of 40 m² facing south. A few minutes from the landing beaches. Independent house. R-d-c: entrance, kitchen, living room with lounge area, fireplace-insert, toilet, 1 bedroom (1 double bed), bathroom and toilet. Upstairs: 2 bedrooms (3 single beds, 1 double bed), each with a bathroom and toilet, sofa bed in mezzanine. Electric heating. 2 TV. Dishwasher, washing machine. Dryer. Crib. Garden with terrace 40 m² swing and trampoline, picnic table. Guests can enjoy the fishing pond located a 5-minute walk from the cottage. We had a fabulous time in this house. As soon as we arrived at the property we were stunned by the beauty of the landscape. The house is very spacious and we felt right at home. The fireplace was nice and kept the house cozy warm. Our daughter loved the swing and slide set and the trampolin in the yard. We would come back any time.